No matter how high-tech it is, a new mattress is never a substitute for medical care. But for patients who are receiving medical treatment for certain health problems, an adjustable bed could certainly improve quality of sleep, quality of life, and overall well-being. At Mattress World Northwest in Portland, the customers who are most interested in adjustable beds for health problems are typically those who have been diagnosed with sleep apnea, poor blood circulation, and gastroesophageal reflux disease (GERD), along with a few others. You probably already know that upgrading your mattress might help you with insomnia. But did you know it might help you regulate your breathing? Sleep apnea is a serious sleep disorder that has the potential to contribute to life-threatening health problems. It happens when the throat muscles relax too much during sleep, blocking the airway. Oxygen levels plummet, causing the brain to force the sleeper to wake up for a second or two to restart breathing. Adjustable beds can help sleep apnea sufferers maintain open airways while they slumber. With the head and upper body at a slight incline, the tissues at the back of the throat are less apt to block the airway. Swollen ankles are the bane of heart disease patients, pregnant women, and sedentary office workers. When blood flow from the feet and legs up to the heart isn’t as strong as it should be, the result is lower extremity swelling. It’s important to support good blood circulation to reduce the risk of complications. Patients are often advised to sleep with a few pillows under their feet, but this is only effective if they only sleep on their back and don’t move around much during sleep. A better solution is an adjustable bed, which can elevate the feet above the level of the heart no matter which position the sleeper prefers. It’s not unusual to get heartburn from time to time, but when it happens consistently, a doctor might diagnose you with GERD. GERD is characterized by the backflow of stomach acid up into the esophagus, causing symptoms like burning sensations in the chest, chest pain, difficulty swallowing, sensation of lump in the throat, and a dry cough. Without medical treatment, GERD can result in esophageal stricture, ulcers, and even precancerous changes. Patients with GERD are often prescribed medications and instructed not to lie down within three hours of eating. It’s important to continue taking any medications as prescribed, but another supportive therapy to consider is sleeping while elevated. An adjustable bed allows patients with GERD to easily keep the upper body elevated, while remaining sufficiently comfortable to fall asleep. 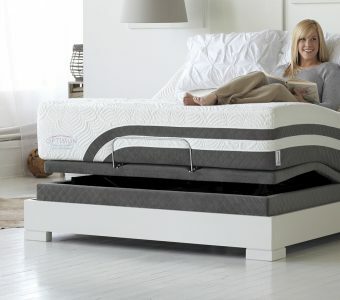 Mattress World Northwest has long been known for our large selection of premier beds, including adjustable power bases by Legget & Platt, Mantua – Rize, Simmons Renew, and Sealy Reflexion. If you’ve been struggling to get a good night’s sleep because of certain health problems, stop in a showroom near you in Portland and find out for yourself why adjustable beds are getting rave reviews. We offer free delivery, special financing, and frequent sales offers.